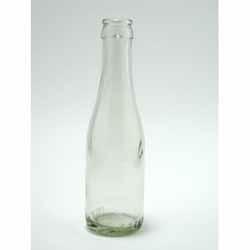 These traditional Champagne bottles can be finished with a plastic champagne cork or a beer cap. Actual shipping rates apply to all cases of bottles. 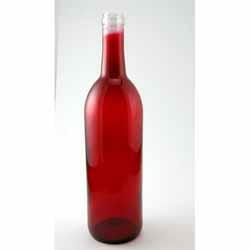 This frosted Bordeaux bottle will compliment any holiday or specialty wine. 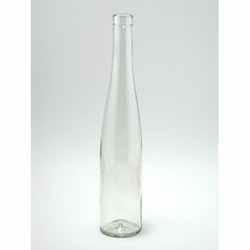 These "stretch" style bottles are perfect for icewine. Actual shipping rates apply to all cases of bottles. 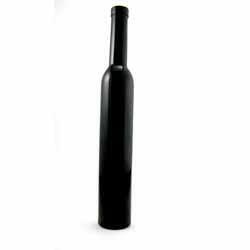 Bordeaux bottles (also less commonly called Claret bottles) contract sharply at the neck. This configuration makes them stay in a slanted wine rack a little better. 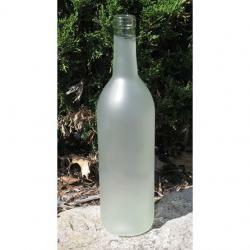 Traditionally people use the green bottles for red wines and the clear (or "flint") bottles for white wines, although you may use them as you see fit! 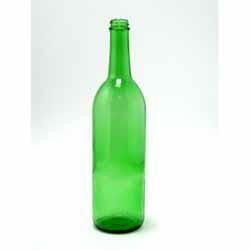 This style of bottle is used for many commercial wines in France and elsewhere around the world. 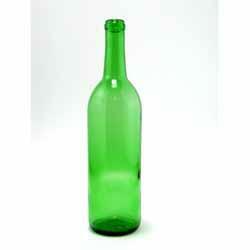 While tradition is a strong motivator, you may certainly use this bottle for any type of wine, at your pleasure. These bottles are 750 ml, or about 4/5 of a quart. They are screw cap finished. They come 12 bottles to the case. 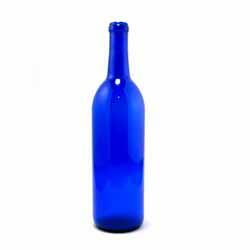 Actual shipping rates apply to all cases of bottles. 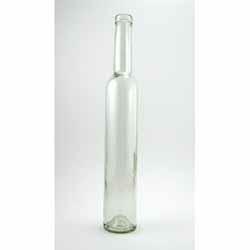 The hock bottle is a tall, slender bottle with long sloping shoulders. Actual shipping rates apply to all cases of bottles. 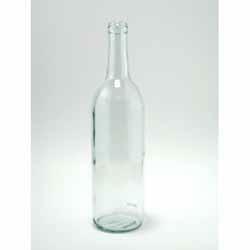 These Burgundy bottles are smooth shouldered with a slightly sloping neck. They are dead leaf green in color, and classically these bottles were used to bottle wines from the Burgundy region, but of course, you may use them as you see fit! 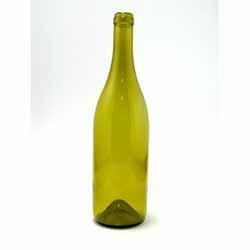 They are great for Chardonnay, Petite Sirah, Pinot Blanc, Pinot Noir and Syrah. They are designed for a cork finish, so use a #9 straight cork. They come 12 to a case and are sold by the case. Actual shipping rates apply to all cases of bottles. 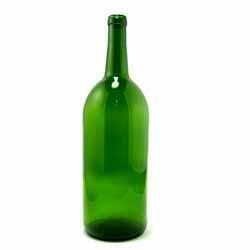 Tradition has a great deal to do with the shape and color of a bottle, and perhaps little to do with what you should actually use to bottle your wine. 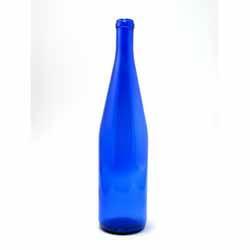 The hock bottle is a tall, slender bottle with long sloping shoulders. Traditionally they were filled with German wines from the Rhine and Moselle regions. 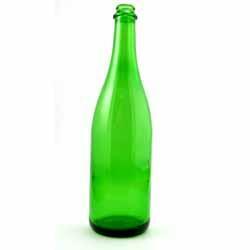 Rhine bottles were traditionally brown (an exception being blue bottles of similar shape from the Nahe region) and Moselle bottles were traditionally green. These were typically light and fruity wines which vary from dry to sweet, so you might use them to bottle wines of similar value. Another positive about sticking with tradition is that it gives you an instant idea about what might be in a bottle in your cellar, especially if you do not label your bottles. The bottom line is though that you can use what you like! 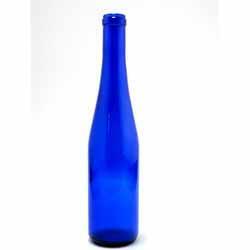 These bottles are 750 ml, and cobalt blue in color, and are designed for a cork finish (that is to say, they must be corked). They come 12 to a case and are sold by the case. 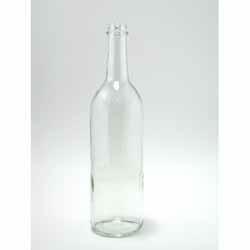 Actual shipping rates apply to all cases of bottles.